The Graduated Byzantine Necklace is the byzantine weave utilizing multiple ring sizes. 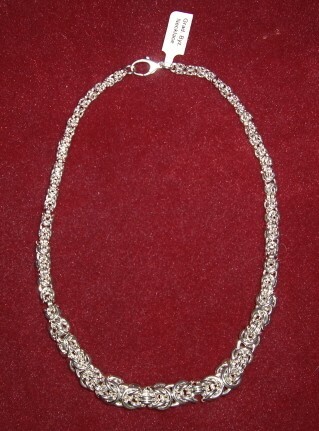 This is a basic chain mail weave that is classic and very beautiful. We offer the kit in two different sizes, large and small. The size refers to the largest section of the necklace, which is the middle section that hangs down. In the large size, the middle section is made with 12 gauge rings. In the small size, the middle section is made with 14 gauge rings. Each can be made in a single color, or in a main color with a second color as an accent. This is a beginner weave that is truly fun to make. The kit is for an 18 inch necklace but you can purchase additional two inch extender kits if you would prefer it longer. A sterling silver or yellow gold filled balloon clasp is included. Two-tone kits are available upon request.